Much like its eclectic Mirvish Village neighbours, Victory Cafe likes to wear a lot of different hats. Cafe, pub, art bar, restaurant, you name it, Victory seems to morph into whatever you'd like it to be. Most days, I'd stop in with beer-lovin' friends for the latest microbrew offerings or head upstairs for an art opening or live performance. This time around, I've got a couple hours before work in the area, so it's time to give the dinner menu a proper trial. 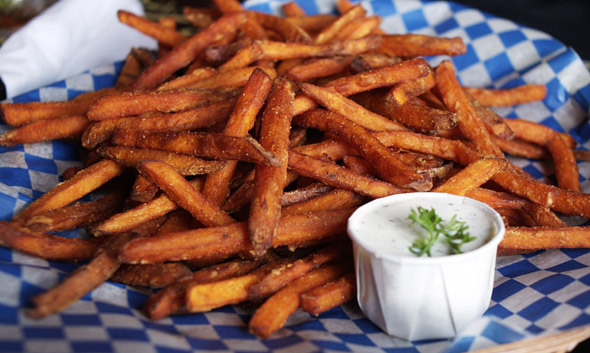 Sweet potato fries ($5.75) are an instant favourite. I usually get my fix of these at Fresh, but Victory's prove much nicer as they aren't fried to the dark, crumbly (though tasty) extent that Fresh does 'em. 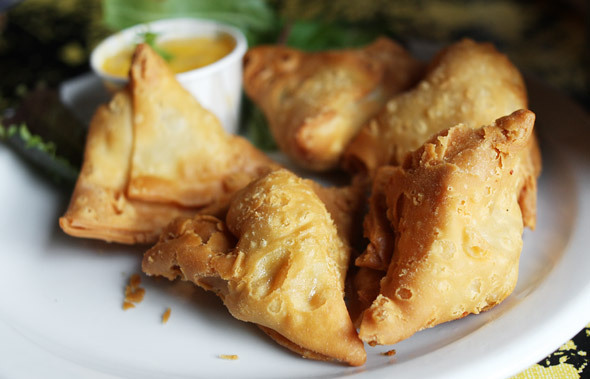 Along with the fries we share another vegetarian-friendly dish: Veggie Samosas (5 pieces for $5.75). Again, we've picked out a great starter. These crispy mini samosas are filled with wonderfully fresh potatoes, peas, etc and are spiced just hot enough to offer some kick without burning out your tastebuds before the entrees arrive. I will definitely be having them again soon. The entrees arrive soon after and are good looking though a tad more hit-and-miss than our appetizers. The Vegetarian Pasta Special ($9.95) on this evening is linguini in a rose sauce with tomato, onion and zucchini. Pictured at the top , it looked great but the looks didn't translate into flavour. Overall, it was nice, but lacked punch - which was only emphasized by soft, overcooked linguini that made chewing quite optional. 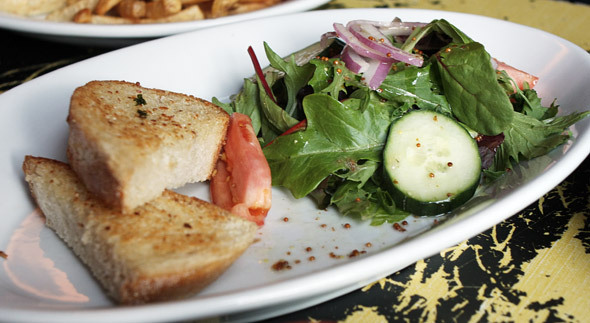 A separate side of garlic bread and salad was a nice touch. 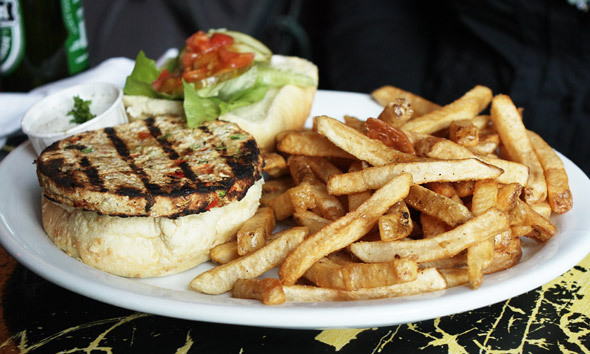 On the flip side, the Salmon Burger ($9.95) turns out to be a great choice. Seasoned well and topped with a mango chutney, the sweet and savoury combo was as unique as it was tasty. The Victory Cheese Burger ($8.75) is also a winner (all puns intended). 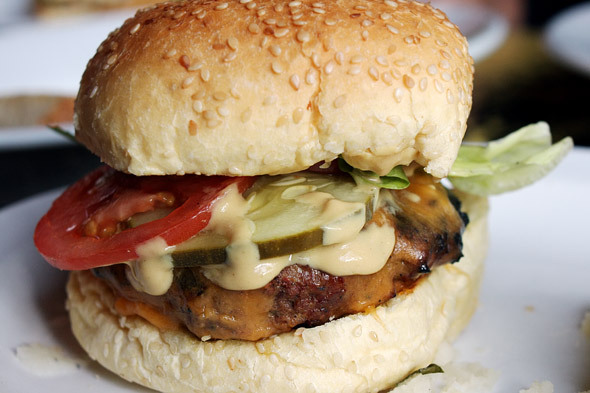 A thick ground meat patty is dense and juicy though I'd encourage a little more generosity with the cheddar (ah-hem! ), please. 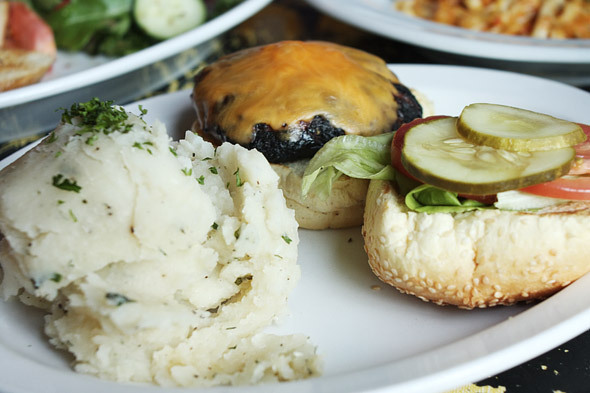 The fries were good, but nothing beats these three creamy words: herbed mashed potatoes. Delicious. 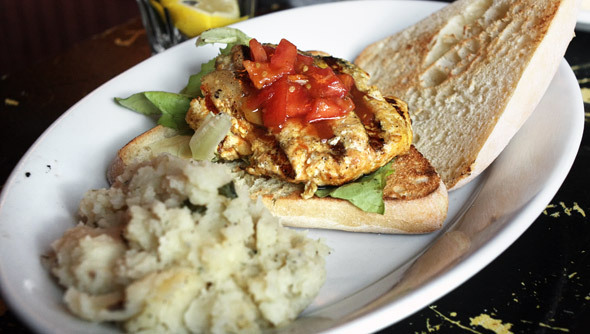 Overall, there is good food to be had at Victory... you may just have to try a few things til you find the winner.